The word in the photo says it all: slow progress today. Wind plus rain plus hills. The good thing about the wind/rain combination in Wales is that often it rains only as fast as the wind dries you so you stay the same level of damp all day. This happy balance lasted till the 2pm lunch stop. The scenery had been utterly lovely, at least what I could see of it! It was a shame to have been so up against the elements but I learned three things. 1) always take your left foot out of the pedal cleat before any steep hill, down OR up. Down: because you might lose control. Up: because you might not make it up and stopping with your feet clipped in never ends well. So now I understand the phrase ‘commit to the hill’: looking at a hill and deciding you can do it with your feet clipped in. Changing your mind is not an option half way up – you are committed! 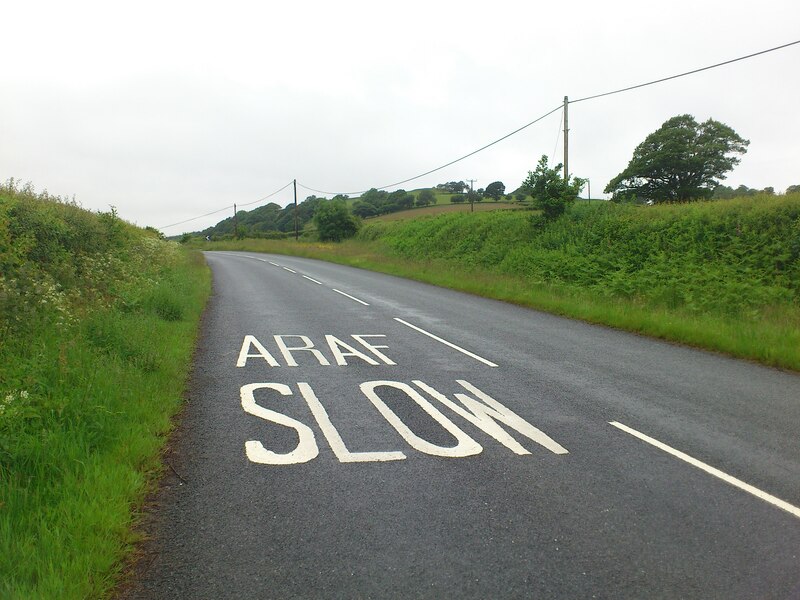 2) Always cycle at least two foot from the edge of the road, especially in Wales where the wind can blow you sideways. 3) The wetter the way, the better it feels to arrive. After lunch the wind/rain balance tilted in favour of heavy rain so I arrived thus evening drenched. My wet weather gear is a huge yellow cape that you can fit two people in (I know this, we have a photo of Matt and I wearing it years ago). Going downhill it acts as a wind break (brake?). I know I look ridiculous but quite honestly I dont care, at least I can be seen and parts of me are dry. Last day tomorrow, Monday but weak internet signal here so may not be able to post this. The route says 60 miles to St David’s but it looks alot further and if the hills are anything like today… I only hope the elements are more favourable.